New Valvo Law Website Launch! 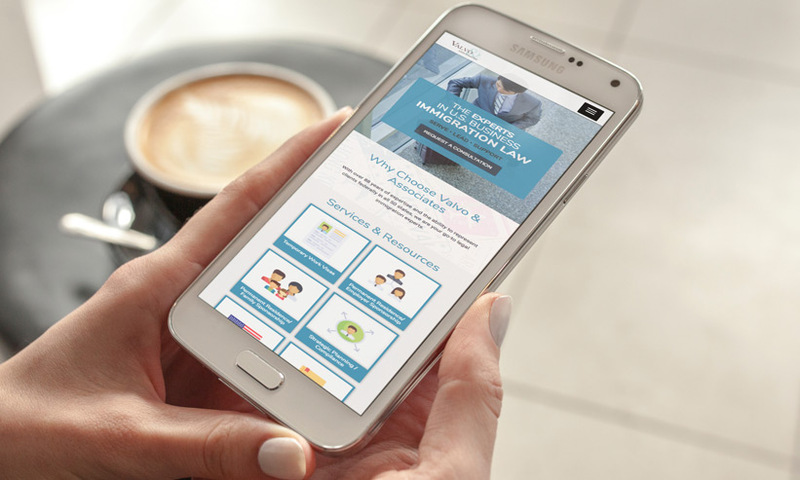 We’re pleased to announce our new Valvo Law website has launched. We worked with LA-based creative agency, Executionists, to conceive of a new, modern, responsive design that describes our professional services and provides valuable resources to our international clientele. Since the majority of our clients are Japanese, we will soon implement the ability for users to view the website in Japanese by clicking the language link. Immigration law and the array of services within it can be very complex and confusing. One of our key goals was to provide useful information and links to anyone considering immigration services. Our solution was to create a clean, modern, and minimalist design in order to impart a better user experience. The home page provides quick links to our key services. On the Services and Resources pages, we display a simple 2 column layout with a side navigation menu. This allows visitors to easily navigate through our informative content. The About Us section provides information about our firm, our attorneys, and the types of industries we represent. The “What’s New” page of the website serves as our publishing section. Here we provide original insights and analysis of immigration and related issues. We recommend all our website visitors subscribe to receive immigration news updates. The Contact page provides the addresses of our offices in Los Angeles and Honolulu. We also have a simple contact form to request consultations. The new site is built on the latest version of WordPress and hosted on Pantheon.io. Google Analytics tracks website visitors and Executionists built us a custom Google Data Studio page that shows us key statistical information with one click. Our staff was provided with website user guides and a training session to help us manage the website content. Even though we get the majority of our business through referrals and satisfied clients, it’s important to have a website that properly represents our eighty eight combined years of immigration services. We hope you enjoy our new website and can easily find all the information you need.